A Rosslyn resident since 2006, J. David Ake is Washington, D.C., photo chief for The Associated Press (AP). Throughout his career as a photojournalist, he's also worked for Agence France-Presse, Reuters and United Press International. Besides D.C., he's been based in Denver, San Francisco, Chicago and New York. When he's not managing photographers for the AP, he's out and about exploring the D.C. area (and, of course, Rosslyn!) with his camera, sometimes as early as 5:30 a.m. Ake says the images he makes during these excursions are done mostly for the fun of it. The Rosslyn BID recently caught up with Ake to find out how he got into photography, what he likes best about his job and what advice he'd give to those trying to establish themselves in the field. 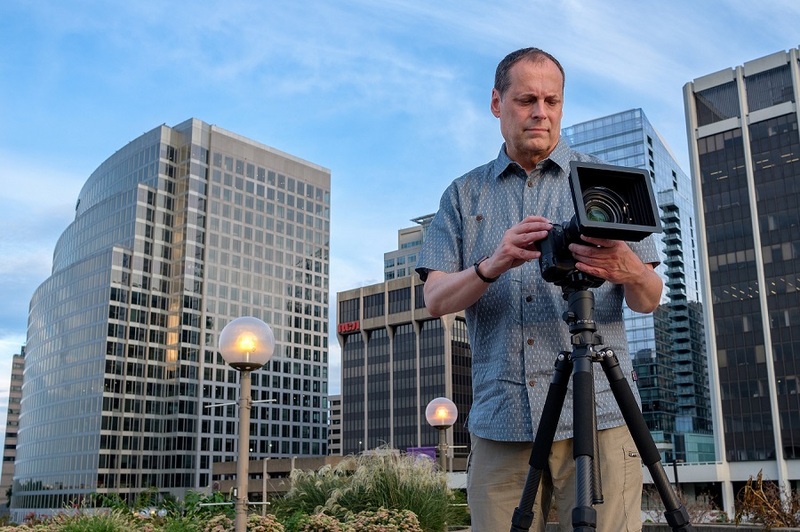 Professional Photographer J. David Ake is a Rosslyn resident who enjoys taking photos of the neighborhood. Rosslynva.org: How did you become a photographer? Were you always interested in photography or did it come later in your life? J. David Ake: I think it all started with the 8th-grade camera club in Littleton, Colo. The darkroom was fascinating to me. I loved developing film. The first time I shot a picture and processed a roll of negatives, I said, "Whoa, this is magic!" and that’s all it took. I’ve never pursued anything else. In high school I was a yearbook photographer. I remember when the teachers went on strike I took a picture and sent it to the local newspapers. It appeared on the front page with my name on it. That was the moment I knew I had found my place in the world. When I was a junior in high school, I realized I liked being in the news part of the business. I shot weekend football games for the local paper, getting paid $25 a game to cover high school football and basketball. I was on the floor, so it was the best seat in the house and I was getting paid to be there! Sometimes I'm still on the NFL sidelines today. Rosslynva.org: Tell us about your current job and the work you do. JDA: After high school I was working and going to school at the same time. I was also interested in politics. Some of my teachers were legislators at the state capitol. I've always had a passion for covering politics. I like the game. That’s how I eventually ended up in D.C., although it was a long route with many twists and turns. Rosslynva.org: What's your aesthetic? Is it different for work versus personal projects? 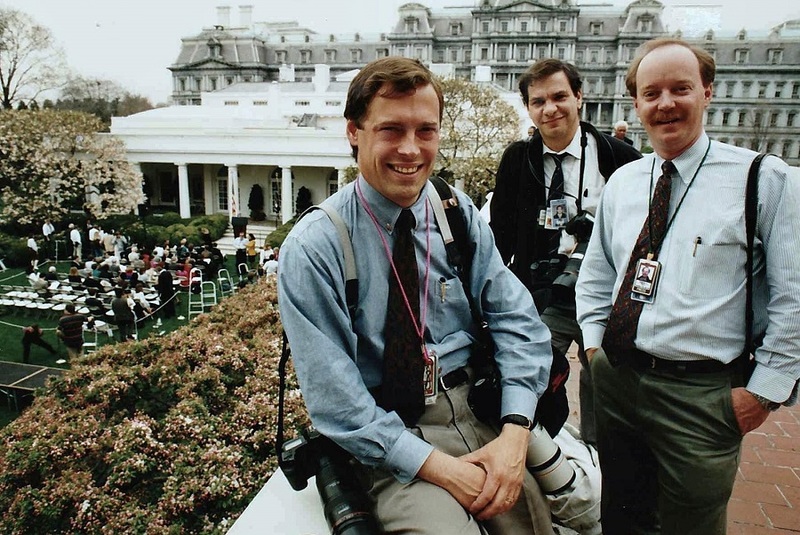 J. David Ake during his days as a White House photographer. JDA: It depends on what I’m doing. If I’m doing news work—which I don’t really do anymore since I'm more of a manager—I’m looking for a moment. I’m watching inflection and hand gestures and background and waiting for the key moment to happen. When you're photographing sports, that's always peak action but it’s contained. It’s between boundaries: You don’t know when a touchdown is going to be scored but you can tell when the offense is doing well. You can get a feel for that. It’s driven by peak moments, though, so if you don't capture that touchdown, you might as well pack your bag and go home. Photographing politics is more subtle: brief looks on faces, a person looking down or looking up. One of my first big political pictures was of Rep. Pat Schroeder when she was running for president. When she withdrew, she cried. It was a powerful moment. Political photography is really challenging and that’s part of what I love about it. Put me on a campaign and I’m the happiest guy in the world. JDA: There's a lot of interaction between the candidate and people. There is nothing like an early campaign when you’re in the room with the future president of the United States and maybe eight other people campaigning in Iowa. There’s nothing like Iowa and the beginning of a campaign. By the end, there are hundreds and thousands of people in a crowd and it's a lot harder to get those intimate moments. Rosslynva.org: When did you start taking photos just for your own enjoyment? JDA: It was about four or five years ago. I manage a group of really incredible AP photojournalists. Most of my time is spent working with them, editing them and assigning them, so I hadn't really been shooting anything myself. But one day I was up at 5 a.m. and I thought, "I’m gonna go to the Tidal Basin and make a picture." And so, I shot Jefferson at sunrise. And I said to myself, “Look at what the hell I’m missing every morning!” Now, I go wandering around the District looking for pretty pictures around sunrise. There's no deadline. I take these pictures for pure enjoyment for myself. There’s a small group of photographers I run into on a regular basis, which is fun. Rosslynva.org: How did you start photographing Rosslyn? JDA: There's a rule: “Whenever you’re shooting something, always turn around,” so one day when I was in D.C. shooting something, that's what I did. And there was Rosslyn! It was pink, and so I shot it, and now I make a habit of it and send the pictures to the [Rosslyn] BID. The skyline has gotten really interesting. I've lived in Denver, San Francisco, Chicago, New York and D.C. All have beautiful skylines. Except D.C., the skyline in D.C. is flat except for the monuments because of building height restrictions. Rosslyn on the other hand has a beautiful skyline with its curves and tall buildings. I often try a long exposure or a different lens, mostly because it’s really pretty and it gives me a chance to make a picture that has nothing to do with journalism. Just enjoy the peace and quiet of capturing an urban landscape. Rosslynva.org: Do you ever take pictures of your own family? JDA: Usually I don't. That'd be like the dentist taking his drill home. When I’m not working I’m home and enjoying it. Rosslynva.org: Does living in Rosslyn influence your photography? JDA: I don’t know that it influences it, but I enjoy the architecture of Rosslyn a lot. I love the new development downtown. The lights over Central Place Plaza (Cliff Garten's "Gravity & Grace") are really fun to play with. I need to get up to The Observation Deck [at CEB Tower]. Rosslynva.org: What do you like about living in Rosslyn? JDA: When I moved here in 2006, I was commuting to New York, which I did until 2008. I picked Rosslyn because it’s fast. You can get to the airport really quickly. At that time I was flying in and out of New York, and 10 minutes to the airport is an unbelievable benefit of living in Rosslyn. And then I fell in love with the area. It’s just fun and it’s grown a lot in the decade I’ve lived here. Driving across Memorial Bridge in the morning is like driving on a movie set. It’s just gorgeous and at sunrise it’s particularly pretty. And you can walk to Gateway Park and participate in the fun events there! Our neighbors are unbelievable, too. We live next to a retired Marine Corps general and a PhD scientist. And you can walk everywhere. How many people can walk to Target? And then you can get your teeth cleaned across the street. Rosslynva.org: What are some of your favorite places in the neighborhood? JDA: Mele Bistro is really good. Frank is great. He’s been redesigning it since we started going 10 years ago. He comes and talks to you and asks about the food. It’s really great. Barley Mac is great and I'll also go to Quinn's and Heavy Seas. Rosslynva.org: What have been some of the favorite shots you've taken? JDA: My favorite changes on a daily basis. It might just be the last picture I made. The 50th anniversary of D-Day as an event was one of the highlights of my career. And I'm coming up on covering 30 Super Bowls and eight Olympics. I can’t really pick a favorite picture. I don’t hang my news work on the wall. I hang my landscapes. Rosslynva.org: What photographers do you admire? Rosslynva.org: Do you have any advice for people looking to improve their photography skills? JDA: Practice. Practice, practice, practice. I get students who ask what it takes to get into the business. I tell them, "You’re gonna starve for five years but keep plugging away at it and don’t give up. You’re going to succeed if you’re the last man standing." It was true of my career and it's true of most people. You’re going to have to be wiling to starve for a while and that will build a sense of character and tenacity and believing in yourself that you need. If you hang in, you’ll make it. And you’ve got to shoot all the time, just all the time. And that’s true now. If I don’t go out and make a pretty picture for a couple weeks, my next one will be awful. It’s a muscle and if you don’t keep exercising it, it will atrophy. To view more of his work, visit J. David Ake's website. All photos courtesy of J. David Ake. Photo at top: One of J. David Ake's photos of Rosslyn.